Here's an almost pocked-sized reprint of one half of another script book My Own Private Idaho & Even Cowgirls Get the Blues. With regards to the movie My Own Private Idaho, there's little if any difference between the two books. Both feature an extensive introduction by Graham Fuller entitled "Gus Van Sant: Swimming Against the Current" and both share the same numerous black-and-white candid photographs taken from both on and off the film set. 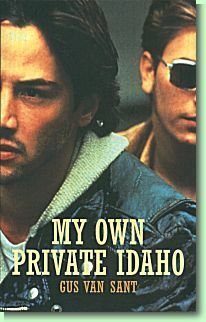 See our review of My Own Private Idaho & Even Cowgirls Get the Blues for more information. Mike Waters is a fragile young hustler who lives hand-to-mouth in the city of Portland, Oregon. To compound his vulnerability, Mike suffers from the extraordinary condition of narcolepsy and is prone to swoon into sleep at unfortunate moments. At least he has the support of a street-gang of vagabonds, arrayed around the Falstaffian figure of Bob Pigeon. But in this harsh world, Mike's dearest wish is to find his long-lost mother; and in the course of his pilgrimage he also hopes for a deeper intimacy with his friend Scott Favor, a wealthy scion who is killing time among the hustlers before taking up his birthright. Gus Van Sant's lovely, wistful drama of life running to waste provided the text for what was probably the finest performance of the late River Phoenix as Mike, alongside Keanu Reeves in the role of Scott. Previous Page Click here for advice on obtaining this item.